Best known for being a job seeker’s ghetto and a social media résumé site, LinkedIn has quietly expanded its effectiveness for businesses in general and marketers specifically. While many businesses understand how to leverage the power of LinkedIn’s job search capabilities, they overlook the social network’s power as a means of connecting them with prospects and building trust. LinkedIn is where business professionals connect and engage around topics of interest to their current jobs as well as their careers. LinkedIn’s top five industries based on number of members are information technology or IT (4.00M), Financial services (2.03M), higher education (1.95M), computer software (1.65M) and telecommunications (1.59M). 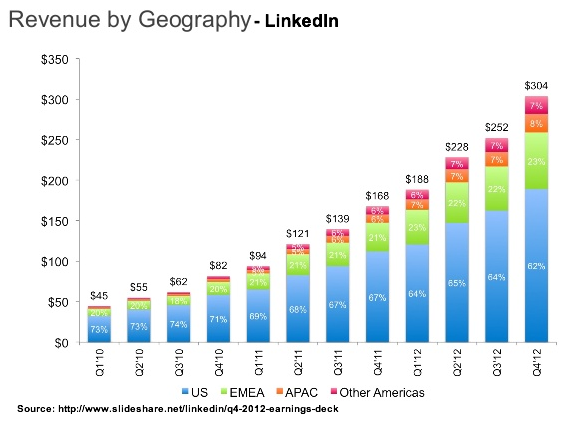 LinkedIn’s top five countries as measured by members are the US (74M), India (18M), UK (11M), Brazil (11M) and Canada (7M). 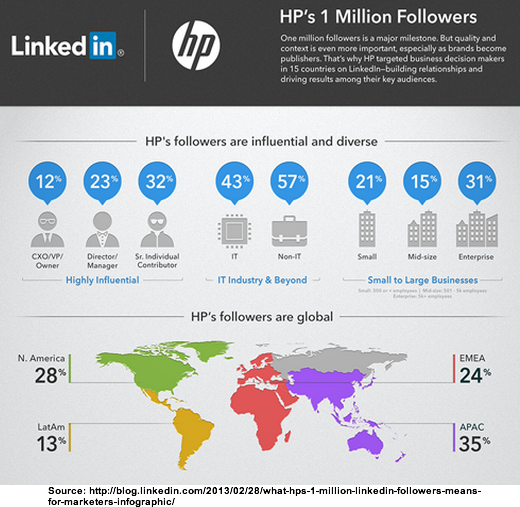 HP has over 1 million LinkedIn followers. This yields 43 million first-degree connections and 138 million second-degree connections. HP’s LinkedIn followers are 2.5 times more likely to recommend HP. 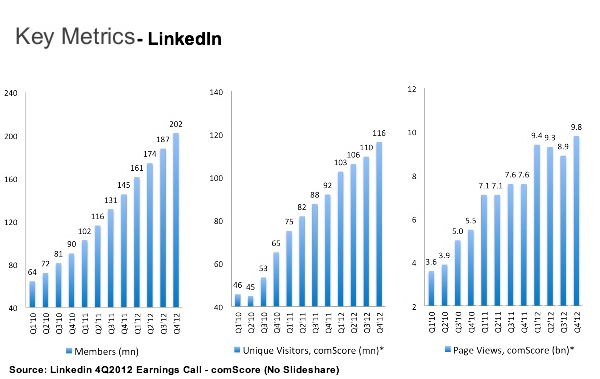 LinkedIn revenues continue to increase. Unlike most social media platforms they come from three different streams: Talent Solutions generated $161.0 million representing 53% of total revenue, Marketing Solutions generated $83.2 million representing 27% of total revenue and Premium Subscriptions generated $59.4 million or 20% of total revenue in 4Q2012. 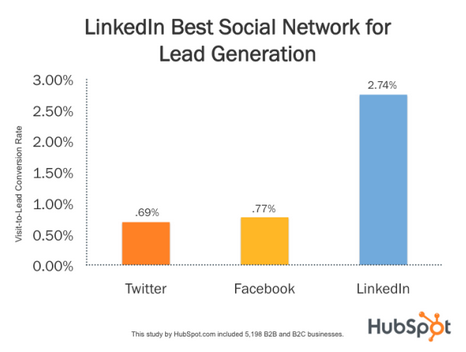 LinkedIn generated the highest visitor-to-lead conversion rate at 2.74%, almost 3 times higher (277%) than both Twitter (0.69%) and Facebook (0.77%) according to a Hubspot study of over 5,000 businesses. 81% of the Inc 500 use Linkedin according to UMass Dartmouth research. 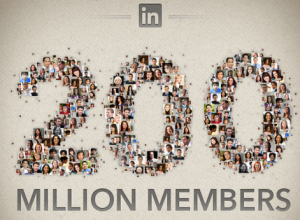 LinkedIn is small business’s top-used social media site. 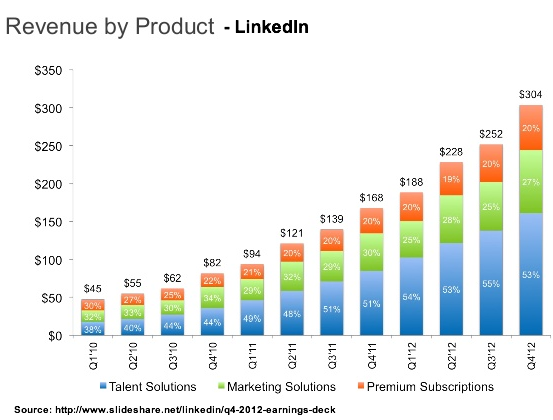 Although this may be attributable to LinkedIn’s ability to reduce recruitment costs rather than generate leads. IT decision makers leverage social networks for business based on IT Purchasing Goes Social, a Forrester Research and LinkedIn study of 400 North American IT decision makers. IT decision makers are three times more connected with peers and others than the average LinkedIn user. IT decision makers are three times more likely to follow companies. Over 70% of IT decision makers engaged with IT vendors on a social network. About three out of five of IT decision makers rely on the social networks for purchasing decisions. Create and join LinkedIn groups. The goal here is to build a community. In addition to growing your own, join other relevant geographic and interest related groups. This is one area where you shouldn’t use your company name. Extend your brand but don’t duplicate it. Also realize that groups aren’t forums for sending out promotional emails. Instead, your goal should be to engage with others and share useful, relevant information. For example, my webmaster is an active participant in the WordPress Problem Solvers group. Provide useful content. The goal is to establish yourself and/or your business as an authority. Like any other social media platform, in order to build trust your content must be relevant and engaging, not promotional. Bear in mind that LinkedIn is less cluttered than other social media platforms so that your message can get through. This translates to regular updates and sharing useful content. Incorporate this content into your social media editorial calendar. At a minimum, make sure that your firm is visible and findable on LinkedIn and start to enhance your presence by sharing valuable content that’s promotion-free. What has your experience with LinkedIn been? Do you have any suggestions? Tags Forrester, HP, Hubspot, LinkedIn, UMass Dartmouth. Bookmark the permalink. ← 5 Facts Prove Visual Content Is A Guaranteed Winner! Thanks for pointing out the effectiveness of LinkedIn. It often seems to be undervalued and not enough people understand its benefits. Good information to remember. LinkedIn seems to be the least talked about social network when it comes to marketing. I’m interested in reading more on this..
LinkedIn is probably the most effective social network for B2Bs. The other social networks can be beneficial, but there’s lots of distraction there. With LinkedIn, the primary focus is business.